Seattle-based naval architecture and marine engineering consultancy Glosten said it has completed the design of a new passenger-only hybrid ferry for Kitsap Transit, a public transportation agency based in Bremerton, Wash. The new hybrid electric 150-passenger ferry will be the first in Puget Sound, and is expected to carry more than 350,000 passengers annually. The 70-foot-long aluminum hull catamaran will be constructed at Bellingham-based All American Marine. It will feature two BAE HybriDrive propulsion systems driving fixed pitch propellers. 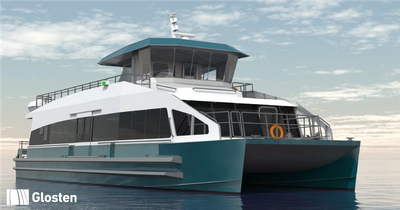 “Outfitted with a battery-diesel hybrid propulsion system, the vessel will operate like a Prius – no more diesel exhaust and noise while passengers load and unload,” said Glosten Project Manager and Design Lead, William Moon, PE. Glosten said its team worked closely with Kitsap Transit to create a ferry customized for Sinclair Inlet, but flexible enough to meet future needs. Passenger comforts were of particular importance to this design and include a variety of passenger spaces with lots of natural light, a unique ADA-accessible bow, and a spacious passenger cabin and sun deck.